The Trump Administration is on the brink of putting a cruel price tag on permission to be in this country. Unless an immediate public outcry stops a new policy from becoming effective, many immigrants will be separated from their homes, employers will lose their employees, and most wrenching of all, immigrant parents will be finding themselves across an international border from their U.S.-born children. Immigrants who don’t have a high enough income, or who receive or are likely to receive health, food, or housing supports, may soon not be able to stay in this country. Published last week, the proposed Trump Rule, a radical reinterpretation of who is considered a “public charge,” would cover anyone applying for a green card through a family-based petition, or seeking to extend or change their temporary non-immigrant status in the United States. The direct effect is shocking, but it is just the tip of this appalling iceberg. If it becomes a reality, experience tells us that the Trump Rule would have a powerfully chilling impact on families with at least one non-citizen immigrant member. They’d become nervous about receiving or applying for Medicaid, SNAP (supplemental nutrition assistance, also known as food stamps), Medicare Part D (which covers prescription drugs), or housing assistance – benefits which, for the first time, would fall under the “public charge” definition of those whose green card applications may be denied. Some, we’re sure, would even be moved by confusion and fear to dis-enroll from benefit programs. The Fiscal Policy Institute (FPI) estimates that 2.1 million residents of New York State (and as many as 24 million people nationwide) could experience this chilling effect; that’s the number of people with a family member who is a non-citizen in which the family has received one of the benefits named in the proposed Trump Rule. A child’s wellbeing is inextricably intertwined with that of the child’s parents. 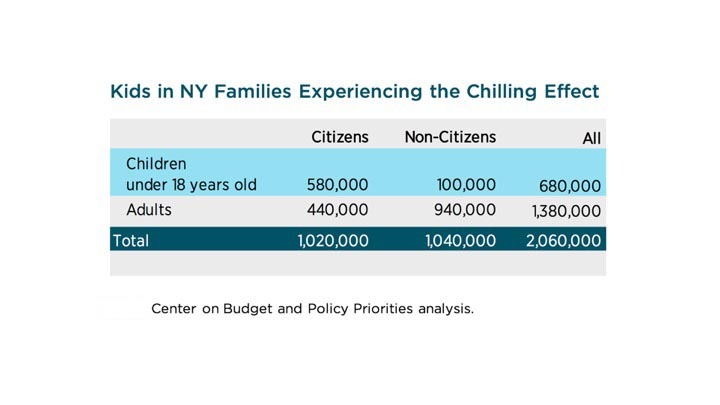 In New York State, there are 680,000 children under 18 years old who live in families that have at least one non-citizen family member and that have received one of the benefits specified by the Trump Rule. The large majority, 580,000 of the 680,000, are United States citizens. Fear around the proposal's interest in Medicaid, not to mention other programs, could lead to 15, 25, or even 35 percent of those experiencing the chilling effect to dis-enroll, all examples modeled in the FPI report as well as in a study from the Kaiser Family Foundation. Disenrollment would mean adults, but also kids—including kids who are U.S. citizens—going without health insurance, with potentially catastrophic consequences. Over the past few months, fear and anxiety aroused by rumors of this proposed change have already caused immigrant families to steer clear of essential public programs, even some not covered by the proposed rule. The proposed Trump Rule has impacted even the youngest of us – infants. This year, providers in New York and around the country have witnessed a decline in enrollment in the Special Supplemental Nutrition Program for Women, Infants, and Children (WIC), a program not included in the proposed rule. Helping kids in immigrant families do well is not only the right thing to do; it’s also a sound investment in the future of our state and nation. One of the clearest and most striking findings in a major study by the National Academy of Sciences is that the children of immigrants, once grown, become among the strongest contributors to the country’s economy. But you don’t even need to take that long view; the negative economic consequences of the Trump Rule would be felt quickly and sharply. An FPI analysis estimates that New York State would lose $1.8 billion annually in federal benefits if just 25 percent of people experiencing the chilling effect make the wrenching decision to dis-enroll from SNAP and Medicaid benefits they qualify to get. These losses would then ripple out through the economy. That’s because withdrawal of SNAP funding means a reduction in spending in grocery stores and supermarkets. When families lose health insurance, hospitals and doctors lose income. And some spending would be reduced in other areas, as families struggle to pay food and health costs. Depending on where we are in the economic cycle, these additional losses could amount to an overall hit to the New York State economy of $3.6 billion – with up to 25,000 jobs statewide lost in the bargain, too. Over the summer, the nation was outraged to find out that the Trump Administration has been using the forced separation of children from their parents as an inhumane tactic of immigration enforcement. The redefinition of public charge doubles down on making children instruments of repressive policy. The Administration’s approach does not include going to Congress for approval, so the only thing that will stop it is a massive public reaction. The Administration has given the public 60 days to submit public comments. Individuals, organizations, businesses, governments, can all do that here: https://www.ouramericanstory.us/. That’s your place to say: Enough is enough! David Dyssegaard Kallick is deputy director of the Fiscal Policy Institute. Jennifer Jones Austin is chief executive officer of the Federation of Protestant Welfare Agencies. This Urban Matters is part of our ongoing focus on how new federal policy and budget proposals impact children in New York City.